Rob and I raised our kids on “Adventures in Odyssey,” produced by Focus on the Family. We measured our road trips by them: “Just five more Odysseys until we get there, kids!” The madcap misadventures, framed in Mr. Whitaker’s constant love and insight, warmed our hearts. We thought Focus on the Family actually focused on the family. But Focus’ founder James Dobson is a far cry from Mr. Whitaker, lacking the compassion and wisdom necessary for someone who speaks so loudly to families, holding instead to predictable conservative Christian-think, in its stereotypical gender roles—and its value of rules over relationship. When Amber Cantorna told me her father, an executive at Focus on the Family, completely rejected her when she came out, my heart sank. Sadly, I was not even surprised. This is not a focus on the family, I thought; this is a focus on standard-issue, unexamined advice dished out by the truckload at Focus, smashing countless families beyond repair. In her just-released book, Amber tells an important story of coming out, coming to terms, and coming into her own, through her family’s cruel but predictable rejection. The church is in real trouble here people. It does not know the difference between the love of Christ and punishment for the noncompliant. Jesus showed us that love always wins, love is the beginning and end of the gospel message, and love is every point in between. Love is God’s way. When we put rules above relationship, we hurt people. Time and again, families drive their children to despair by holding them to their own standard for that child, instead of embracing the child God gave them, exactly as they are. Such conditional love is deadly. What emerges in all of this is the clear distinction between the gospel of inclusion modeled and taught by Jesus and the gospel of exclusion modeled and taught by the non-affirming church. Amber’s story, told with love and deep reflection, is at once compelling, heartbreaking story is still full of hope. Her love and beauty and heart shine through in a life restored. Her journey of authenticity has cost her dearly, but it has also freed her. I imagine if Mr. Whitaker could read her story, he might shake his head and say, “Jesus wants us to focus on love, not being right—on coming together, not breaking apart.” I also imagine he’d like that the story has a happy ending. Click here to find out more about Amber’s new book, Refocusing My Family. Amber’s story of life, love, and restoration is an adventure you don’t want to miss. 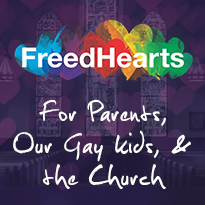 We have ‘pay-what-you-can’ video courses helping parents love, accept & affirm their LGBTQI children; helping those in the faith community be more loving & fully inclusive; and helping LGBTQI heal shame from family, church & community wounds. We also have private Facebook support groups for parents, and other resources. Please click here. Yes, it is really sad the tunnel vision and the digging in of heels by many churches, church leaders, and the like. Education is so needed in this area to these leaders and groups to love all, include all. It is sad that a child can be rejected for just being born the way God created them. This is medical science and they just won’t hear it.I feel so sorry for many in the LGBTQ community, but I say live on and you are so much more than your orientation……..so much more.